This is a marvellous, beach-side site, attractively situated at the foot of Tamarit Castle at one end of a superb one kilometre long beach of fine sand. It is landscaped with lush Mediterranean shrubs, studded with pines and palms, and home to mischievous red squirrels. There are 470 good sized pitches for touring, all with electricity (16A), 340 of which are fully serviced with water, drainage, TV connection and 16A electricity. Fifty very popular pitches are virtually on the beach. On hard sand and grass, some are attractively separated by hedging and shaded by trees. Accommodation in the form of bungalows (156 pitches) is also available to rent. The management and staff here are very keen to please and standards are very high. The charming restaurant and snack bar both serve typical Spanish dishes whilst enjoying superb views of the sandy beach and castle. The vast, attractively designed, lagoon-type swimming pool and paddling pool boasts a restaurant, snack bar, two bars, and sun terraces. It is excellent. The site boundary with the beach has three controlled accesses. 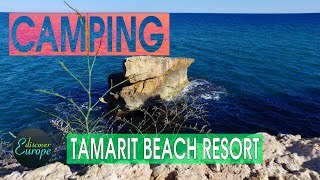 Tamarit would be a good choice for watersports enthusiasts or a family holiday by the sea. The early morning sun shining on the blue sea and the golden stone of Tamarit castle high above is a memorable sight! The high quality sanitary blocks (two heated) are modern and tiled. Private bathrooms to rent. Laundry facilities. Motorhome services. Fridge hire. Gas supplies. Supermarket, boutique, bars, restaurant and takeaway. Bakery. Wellness area. Swimming pool. Tennis. Pétanque. Bicycle hire. Minigolf. Playground. Sports zone. Club room with bar. Miniclub. Entertainment programme. Fishing. WiFi throughout (code). From A7 take exit 32 towards Tarragona for 4.5 km. At roundabout (km. 1172) turn back towards Atafulla/Tamarit and after 200 m. turn right to Tamarit (beside Caledonia Bungalow Park). Take care over railway bridge, then immediately sharp left. Site is on left after 1 km. past another site (Trillas Tamarit). 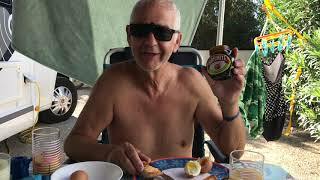 2018 European Tour Part 6 - Tamarit Beach Resort.